Aikatsu Friends! – 051 | Mezashite! God, this episode was fire and hot and EXCELLENT! The best, most exciting and hype way of starting off a new season in at least a year. Just when you think it can’t get any better, it does, over and over again. Now quickly! Go and watch! There was also something requesting an actual TL note the week. If somehow you weren’t aware of it, the story referenced was Amaterasu and the cave of Ama-no-Iwato. The specific person talked about is Ame-no-Uzume, known for her rather… lascivious dance. That explains the clothes being thrown off. Aikatsu: As educational as ever. Aikatsu is back with a new season; bigger and hotter than ever. 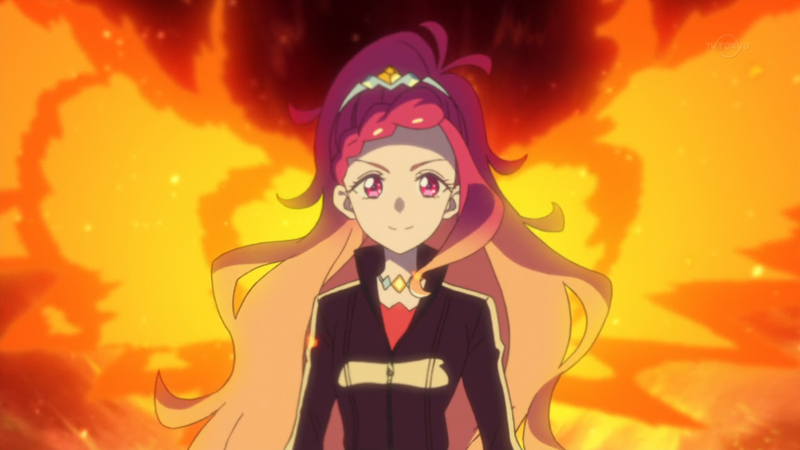 I wanted to take a break this season from all anime, even Aikatsu, but now you tell me this new character is a combination of two of my absolute favorite Aikatsu characters (Juri and Elza) and that this is an amazing season opener? This was a bloody joke wow just wow I can’t believe how far Aikatsu! has fallen this episode was pure crap did they really think by just adding a whole bunch of crap into it. That it will make up for how bad and lacking the first season of Aikatsu! Friends was. I have been hoping and hoping that they would fix up the show but no just no they just keep making it worse god dammit. Adding a whole bunch of crap? Uhhhh….that’s what a merch driven franchise is SUPPOSED to do!!! And maybe if you don’t like it, the DON’T WATCH IT!!! Have yet to watch the most recent episodes, but I’m nervous that I might agree. Then again, it could go the other way and this could be a big step up for me. It was an interesting introductory episode. I thought Hibiki would be more like Elza, but that was actually way off the mark. Now I’m not sure what to expect. Idol activities in outer space though… this is getting wild. I hope they remember the space suits, otherwise they are gonna go Total Recall during a stage. Well, interesting first episode, we will see where this season of Aikafriends is going to lead us. Personally not a big fan of Hibiki, but getting to know her personality at least made me accept her, the design is absolutely not my cup of tea. Alicia on the other hand… Fell in love with her right away. Hibiki’s song was surprisingly underwhelming. She suffers a bit from the same issue I had with Meltic Star in Kiratto – the song doesn’t seem to fit her personality, at least from my point of view. Hibiki has such a powerful personality that I felt like her song needed to give off more dance vibes or be some kind of rock song thats powerful. Oh well, maybe future songs will be more fitting? We will see. Can’t wait for Alicia, her design caught my interest! Also, is Aikatsu dipping its feet into PriPara/Kiratto territory? That glowing dress was known as “Cyalume Change/Cyalume Coord” in PriPara and this honestly looks very similar. Not that I mind, I think it’s a cool idea! Very curious where all this is going to lead. Jewels seem to be the big thing for idols right now, seeing how both Aikafriends and Kiratto have a very similar theme for their second seasons, but with different approaches. Here’s to a new year full of idol shenanigans! Hey Friends, this is not Episode 51, it’s a completely “new show” starting with episode 1. The listing sites (MAL, Anilist etc.) have it listed as “Aikatsu Friends! : Kagayaki no Jewel” in their databases, so continuing this simply as Aikatsu Friends Episode 51 is not working out with auto-updaters such as Taiga. If you could please list it correctly in the future, thank you. I understand your point. This is the first season to include the new subtitle in the actual logo as well, despite previous series also having various official or unofficial names (Akari Generation, Star Wings, etc). However, it is still the very same Aikatsu Friends, episode 51. It also works perfectly well with my Taiga; I suggest you manually add it to your list and then select it from available titles while playing the episode. If MAL doesn’t work, then I also recommend AniList, which you can easily port all of your information over to. In any case, we aren’t changing the numbering, but thanks for your comment. Thanks for the answer. My Taiga is recognizing it just fine, it’s just that it thinks it’s Episode 51 of Kagayaki no Jewel, making the recognition invalid and thus not updating my Anilist profile. I had to change the episode number in the filename manually for it to work. That’s not a good solution for the future. I know this is not how it worked all those years with Aikatsu, but Kagayaki no Jewel is a separate entry on every single anime database site this time and they’re not gonna change it since all of them are in on it. It’s gonna be hard for people to look up this release in the future if you keep leaving it as “Aikatsu Friends” and it’s just gonna create problems and questions with people using listing sites and updaters. Will you please reconsider? For what it’s worth, even the official website synopsis calls it Episode 51 (as it did the beginning of Stars S2). Looks like a mistake on MAL’s part. I used to be a moderator there in charge of this sort of stuff and I’d say it’s not a mistake. It warrants two different entries in this case, at least according to the database guidelines used there. It’s still episode 51 to me, as was Wings of Stars, so I understand your point. This is a bit of a fringe case for MAL, at least. It continues without a season break and is indicated as episode 51, and that would typically make it the same entry. However, a new title tends to result in a separate entry, and this time the new title is actually significant. It’s kind of a “however they want to do it” scenario. @shiho While I understand what you say, it’s also MAL, Anilist etc.’s fault to think of this as a completely different season and not part of the previous one since, as you can see in their FAQ, if a series does NOT have at least a week break it’s intended as continuation of the previous one. I wonder how that works with Precure? Maybe they make an exception for it. I mean, each year is a completely different series. It’s been over ten years since the last one that went for two years, but that was also marketed as a completely different season (Yes! 5 and GoGo). Not really comparable to Aikatsu. The Prism series is a more apt comparison. PriPara lasted for something like two and a half years, and then there was a year of Idol Time. Now PriChan is entering its second year and just had episode 52. Speaking about Prichan, did you watch S2 debut, Akatsukin? Di you like it? Meltic Star got Honey Cat’d, except HC is back due to the time skip and I like MS the most still despite being gone. It’s always exciting whenever Dear Crown comes out of nowhere all “Sup Prism Stone, ready to die?” and sticks that rivalry in it. And so far I’m not judging Maria, Suzu, and Dia as individuals or a unit, since they haven’t shown whether they’re magically better than Kiratts or not yet. It’s always difficult to introduce a season 2 rival that’s somehow on par with the winners of season 1 without it seeming forced, but Friends did it exactly right. I’m holding off on PriChan until we see just how strong the new girls are. That mysterious bangs girl who likes Kiracchu is the most intriguing for me right now. Oh yeah, and there being both Jewel and Jeweling Dresses this season is NOT Odayaka. It’s the new advertising, subtitle and timeskip that complicates matters, not the one-week break. OH GOD… That was hype and hot as hell! I was super excited about this new season, but this beginning exceeded all my expectations. That was a real Big Bang! Can’t wait for what’s to come! I feel like overall, Aikatsu Friends is significantly weaker than Aikatsu Stars. The world seems a lot smaller compared to Stars. Even the new dresses feel like a carbon copy of the Star dresses. Is it safe to assume that, one year later, Pure Palette are still the Diamond Friends? Wow. This episode was scorching! Left me completely starstruck. Loving the new ED song and new characters already. This was about as explosive and as much of a statement Aikatsu episode as I can remember in quite some time. Not only did Hibiki remind me of the aforementioned three characters Akatsukin brought up, but even Johnny Bepp (still the best Aikatsu teacher) because of the similar English phrases and commanding energy they wield. Hibiki and Mirai have some serious damn history and chemistry between them as well. And last, but not least I am loving Aine’s new do. This could be one hell of a season for Aikatsu Friends! Can’t wait to see what this season has in store. Great start really hyped for the next episodes.